Is Kenya's response to terrorism making it worse? Nairobi, Kenya – The Kenyan government’s response to terrorism may have made the problem worse, new research shows. 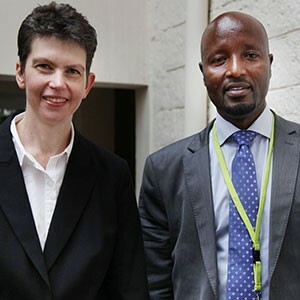 Many Muslim youths joined extremist groups as a reaction to the Kenyan government’s collective punishment or assassination of religious leaders, says senior researcher Dr Anneli Botha from the Institute for Security Studies (ISS). Very little research has been done into why young men join al-Shabaab and the Mombasa Republican Council (MRC). The independent academic research led by Botha – with the assistance of organisations such as the Kenyan Muslim Youth Alliance – included interviews with 95 people associated with al-Shabaab, 45 associated with the MRC, and relatives of people associated with the organisations. A summary of Botha’s research findings has been published by the ISS in a new paper titled Radicalisation in Kenya: Recruitment to al-Shabaab and the Mombasa Republican Council. The research shows very clear differences in the type and motivation of people who join the MRC and al-Shabaab. The MRC is driven by ethnic and economic factors, while al-Shabaab’s core is radical Islam, and the two have a common enemy in the Kenyan government. It would be wrong to place extremists from both groups under one banner. ‘You have to properly understand the roots of radicalisation and terrorism if you want to deal with it,’ Botha says. She explains that the assassination of Muslim leaders has radicalised and recruited dozens, if not hundreds, of people into extremist organisations. The Kenyan leadership has not addressed growing radicalisation and government has mostly denied that domestic circumstances contributed to the radicalisation of Kenyan nationals. Yet security in Kenya is also increasingly politicised, which affects the way the Kenyan government responds to terrorism. Instead of attempting to bring people together, politicians are harnessing political divisions for their own ends, which further threatens national unity. Local conditions have enabled frustrations to grow, enabling al-Shabaab to strengthen its foothold in Kenya, Botha says. During the study, most al-Shabaab and MRC respondents said what pushed them to finally join radical organisations were injustices at the hands of Kenyan security forces, and ‘collective punishment’. ‘Lashing out against the collective is ineffective and counterproductive, and a real danger exists it will drive individuals to extremism,’ Botha says. The single most important factor that drove respondents to join al-Shabaab, according to 65% of respondents, was government’s counter-terrorism strategy. The research showed that Muslims in Kenya feel discriminated against, and 73% of al-Shabaab respondents said they ‘hated’ other religions. Nearly half of al-Shabaab respondents (49%) identified the government as the source of the threat to their religion. The research found no direct link between poverty and the reason why respondents joined al-Shabaab and the MRC. More than half of respondents joined al-Shabaab and the MRC between the ages of 10 and 24. Nearly all al-Shabaab (96%) and MRC (87%) respondents said they had high levels of frustration when they joined the organisations, illustrating the role emotions play in the radicalisation process. Most al-Shabaab respondents (87%) referred to religion or the need to respond to a threat to their religious identity as their motive for joining. Economics were a much larger factor in recruitment to al-Shabaab in Somalia, where researchers interviewed 88 former fighters in Mogadishu in April 2014, in a separate study by the ISS and Finn Church Aid, which used the same methodology as for the Kenya research.